We are trialling out Ice Blasting Service. Initially we are only offering Wet Ice Blasting. Once we are happy with our process, and how the service works we will look to offer the additional services. We fire normal Ice cubes at the speed of sound to decontaminate and clean. 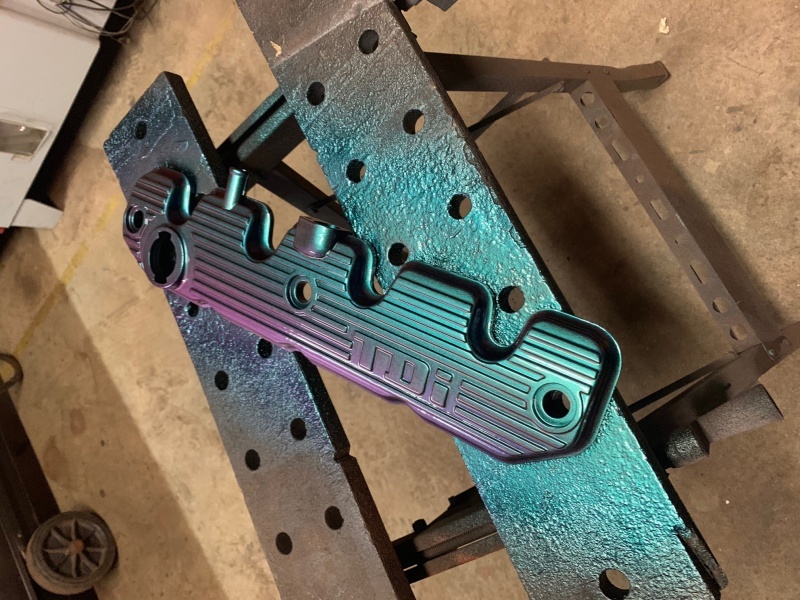 This method will not remove totally sound paint, so is a great option for cleaning up axles, rocker covers and such that have been poorly painted, coated in underseal, Dinitrol, Waxoil or that you jsut want to have the coating checked that it has adhered correctly. This method will tend to remove more paints on softer metals such as aluminium. It will not scratch, key, or abraid metals. Also suitable for thicker plastics. great for de-coking engine heads and more. Coming Soon. we will be firing frozen CO2 at -80C. Dry ice removes powdercoat, and paints in almost all circumstances. No abrasion, No moisture. the most aggressive blasting method without actually damaging the metal. Also suitable for wood. Available soon in a small 180 Liter blast cabinet, we will be accepting items for sand blasting. Items may require wet blasting prior to use in our blast cabinet to prevent contamination of our blast media. Sand blasting will remove most coatings except some rubberised coatings. It will scratch the surfaces, and key them ready for painting. Available soon. Suitable for larger items. relatively aggressive and keys/ scratches the surface. This service is a basic cost effective service used to clean items such as engine parts, and non delicate parts. Using 155C steam we can remove most contaminants, underbody waxes, ingrained dirt and debris from most items with no damage. Only for use on metal parts, and relatively gentle. Small items up to engine head/ 25>30KG can be delivered or posted to us. Prior to work commencing they will be inspected and photographed, and you will be given an idea on the expected outcome of the blasting. All items to be blasted due to the nature of blasting will have to sign a Damage waiver, however all care will taken with your item, and any potential issues we forsee we will advise on. Please select the method of return carriage you require when checking out, and we will send your items with that service such as 3>5 day, or Express. This can vary, and items are done in job lots per process. We typically use each process more than once a week, so items should be back with you 1>2 weeks after arrival including return shipping to mainland UK.